Roughly half of the U.S. population owns stocks, which equates to approximately 156 million people. Those 156 million people along with millions more around the globe determine the value of our portfolios. When the aggregate outlook for the economy, earnings, monetary policy, and geopolitical developments is favorable, stocks tend to rise. Conversely, when the aggregate opinion of all investors shifts to a “we are concerned about the future” posture, stocks tend to correct as they did during the second half of 2011. 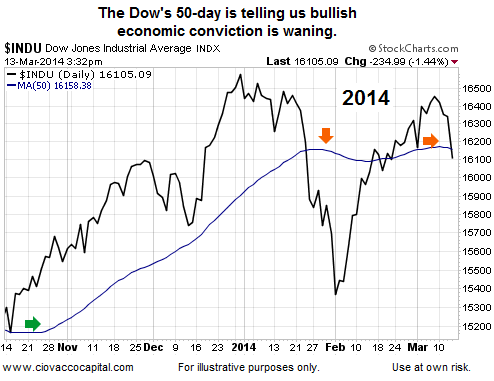 How likely is another stock market correction in 2014? To answer that question we will focus on investor conviction now vs. then. Russia said it had started military exercises near the border with Ukraine, in what is likely to be seen as a show of force in the standoff with the West over the Crimea region. Meanwhile, German Foreign Minister Frank-Walter Steinmeier said Germany assumes this weekend’s referendum in Crimea will be followed by steps to absorb the region into Russia, and if there is no change in direction the European Union will be forced to consider a further, third stage of sanctions. If you want to be prepared for the next correction or bear market in stocks, it is logical to study past corrections and bear markets. Traders and institutional investors use moving averages to filter out day-to-day volatility, which allows them to focus on the underlying trend. Trends speak to investor conviction about the economy and markets. The 200-day moving average is used to monitor the health of the long-term trend. The 50-day moving average is used to monitor the intermediate-term trend. When the stock market’s trend is tentative, it indicates a shift in the aggregate economic outlook of all investors around the globe. Since the longer-term bullish trends remain relatively healthy in 2014, we will focus on stock market corrections, rather than a full-blown bear market. 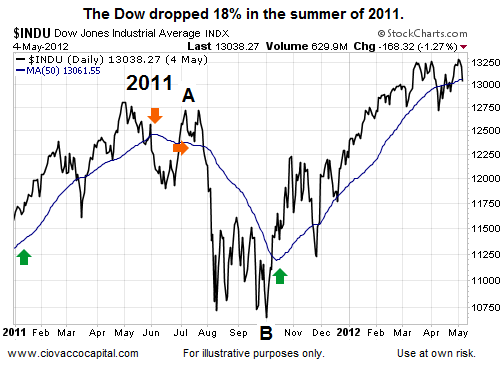 The chart below shows an 18% drop in the Dow that occurred in 2011 between points A and B. The blue 50-day moving average rolled over twice (see orange arrows) raising warning flags before the waterfall plunge occurred in early August 2011. The negative slope of the 50-day told us the aggregate interpretation of the fundamentals had shifted to “net bearish” from an intermediate-term perspective. On the bullish side of the ledger, the green arrows show periods where the aggregate interpretation of the fundamentals shifted back to “net bullish”. How Does The Same Chart Look Today? Recent weakness in U.S. economic data. Fed tapering of bond purchases. Weak economic readings in China. The day’s losses came amid the downbeat China data . Industrial output in the world’s second-largest economy came in at a lower-than-expected 8.6% rate for the January-February period. Retail sales rose 11.8%, but that missed expectations of a 13.5% increase. China is the European Union’s second-largest trading partner. Is the 50-day moving average a foolproof way to monitor investors’ perception of the economy? No, but it does a good job summarizing the current vulnerable state of the equity markets. The observable evidence has deteriorated enough to warrant an incremental reduction to the equity side of our portfolios, which is exactly what we did Thursday. Today’s move, as noted below, speaks to risk management. We still own U.S. stocks (SPY) and technology (QQQ); we just own a little less than we did Wednesday. Our next chess move will be based on new data and evidence. We will enter Friday’s session with a flexible and open mind. The Federal Reserve will play down improvements in the labor force next week, reassuring the market that the Fed’s key lending rate will remain near zero for a considerable amount of time, said Bill Gross, founder of Pimco, the world’s largest bond-fund manager.